Do you ever come back from vacation and have no idea how much time has passed? That happened to me. I spent the first 9 days of February on a cruise. Well, one of those days was flying to Florida and another was sitting in the Orlando airport waiting to get home, but 7 of them were definitely on a cruise ship. There’s something about taking a vacation at the beginning of the month that just throws everything off for me. Valentine’s day is THIS WEEK. Like on Thursday and I haven’t spent one day this month being aware that it’s already February! 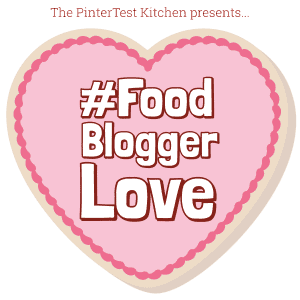 But, what comes in February is #FoodBloggerLove, the blogging event, hosted by Allison of The Pintertest Kitchen. Participating bloggers can either share a Valentine’s Day recipe or be paired with another blogger and make one of their recipes. But the real point is to show some love to our fellow bloggers. When you think of Valentine’s Day recipes do you think of red velvet desserts? I do. Those and chocolate covered strawberries. But there’s not much of a recipe to share with you for chocolate covered strawberries, so Red Velvet Cupcakes it is. Confession: the cream cheese frosting is totally my favorite part of the cupcake. Next question: when you think of red velvet cake do you think of the armadillo cake from Steel Magnolia’s or is that just me? Food coloring gel, such as Wilton’s, will provide a deeper, red color. Buttermilk substitute: 1 tbsp vinegar to every 1 cup dairy milk. Let sit until it curdles. 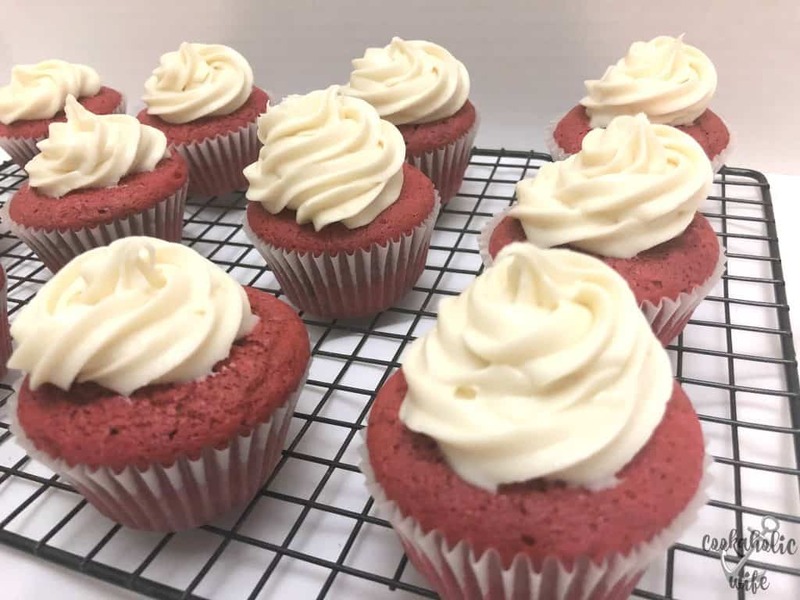 Red Velvet Cupcakes with Cream Cheese Frosting are easy to make from scratch. 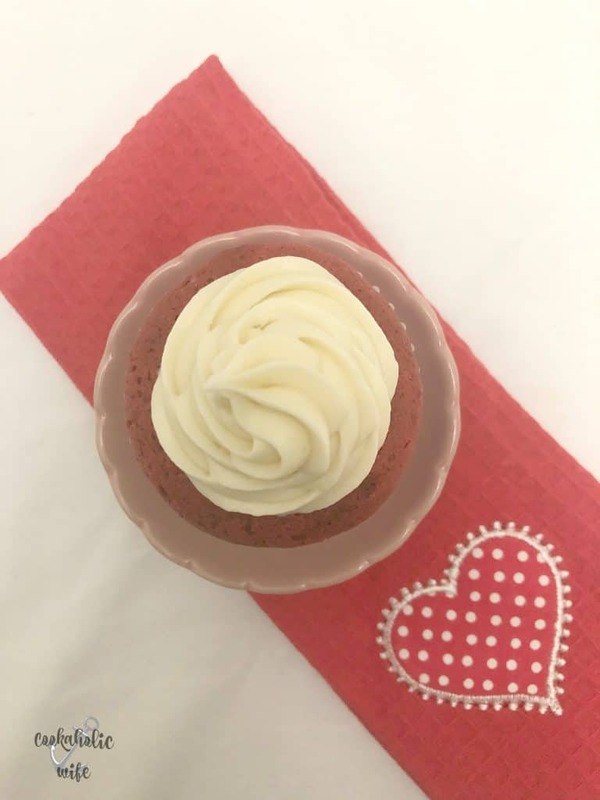 The light and airy cupcakes are topped with a rich frosting and the perfect dessert for Valentine’s Day. Preheat oven to 350 degrees. Line 2 cupcake tins with liners. Pour buttermilk into a large measuring cup. Add food gel or coloring and whisk until fully combined and buttermilk is a deep red. Set aside. In a small bowl, add baking soda and vinegar, mix to combine and set aside. In a large bowl, sift the cake flour, cocoa powder, baking powder and salt. In the bowl of a stand mixer, add butter and sugar and beat on medium speed until light and fluffy, about 3 minutes. With the mixer off, add 1/3 of the flour mixture and 1/3 of the buttermilk. Mix on low until fully combined. Add another 1/3 of each and once combined, add in the remaining 1/3 of each. Add the baking soda and vinegar mixture and mix to combine. Divide the batter between the cupcake pans, filling each cavity to 3/4 full. Cool cupcakes on a wire rack. Add cream cheese and butter to a stand mixer and beat on medium high speed for 3-4 minutes. Add in the vanilla. Slowly add in the powdered sugar on low speed, 1/2 cup at a time until fully incorporated. Transfer frosting to a piping bag fitted with a large tip. Once cupcakes have cooled completely, pipe frosting onto cupcakes. Do you wonder where food come from or are you just content to eat it? I like knowing the history and in case you’re like me, I’ll spare you the trouble of looking it up. (If you didn’t already know.) 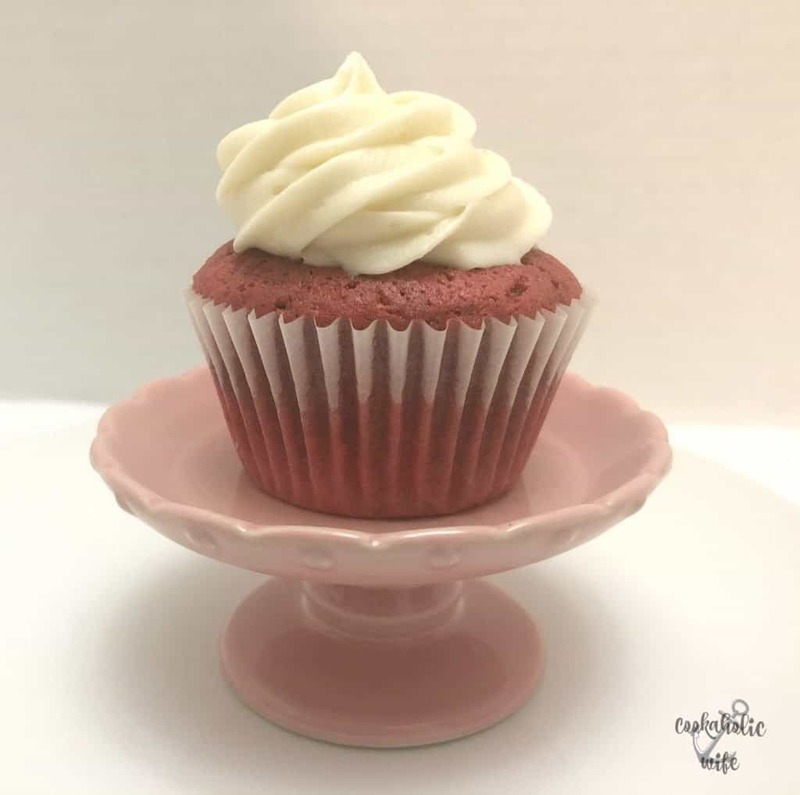 Red Velvet Cake came about in the 1920’s when many bakers resorted to using the juice from boiled beets to enhance the coloring of their cakes because WWII had caused foods to be rationed. The cake became more popular when red food coloring became widely available. I can’t imagine having to use beet juice to color a cake, but that may also be because I can’t stand beets. 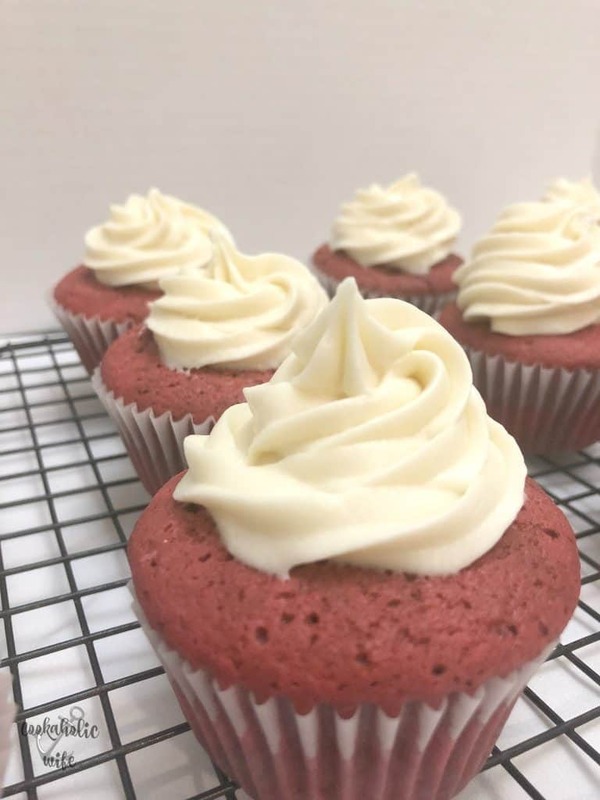 These Red Velvet Cupcakes are delicious! They’re light and moist from the cake flour and buttermilk and sweet from the cream cheese frosting. It’s not often I’ll cut off the bottom half of a cupcake and put it on the top to create a cupcake sandwich, but this is definitely one of those times! 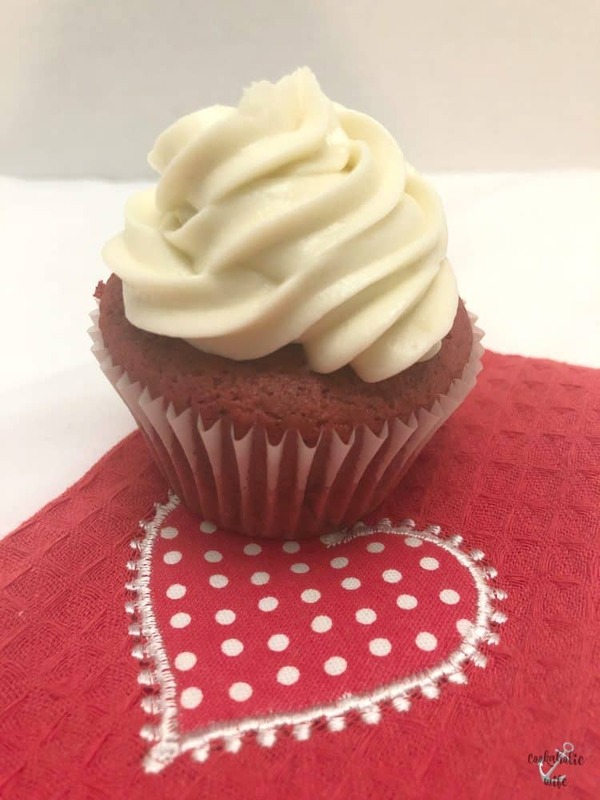 Red velvet makes for a perfect Valentine’s Day treat or dessert! These look delicious! Red velvet cake always reminds me of my childhood. These cupcakes however, are so grownup with their towering swirls of icing – lovely touch.